As of right this very moment, the 2011 Yankees roster includes neither Derek Jeter nor Mariano Rivera, nor does that team have a manager. And Brian Cashman reiterated yesterday that he has no plans to discuss extensions for any of them before this season begins, adding that he doesn't think it'll be a distraction. He's right. Because there's no chance of Jeter or Rivera playing for another team, it removes any potential drama from the next nine months or so. Unless you're interested in exactly how much money will be deposited into either man's bank account — Jeter especially is going to get paid — you can rest assured that both will be back in pinstripes (assuming Rivera doesn't retire). Girardi's a bit of a different case. 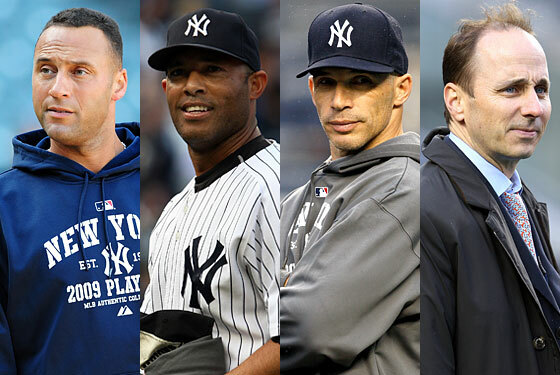 The phrases "Yankees manager" and "job security" typically don't go together, and it's not uncommon for coaches or managers to have their contracts extended to avoid exactly this type of lame-duck situation. But he's pretty safe, too. We're sure there will be some faction of Yankees fans who'll call for Girardi's job if this team loses four straight in June, but for the most part, he should be cut some slack, considering he did just manage them to a World Series win and all. (Compare the situation to football's Giants, where Tom Coughlin's job wasn't in serious jeopardy despite a hugely disappointing year, mainly because he won a Super Bowl two seasons ago.) Barring a disastrous season, Girardi should be back in 2011. For how long (and for how much money) will be determined by how well 2010 goes. The Post article adds that Cashman — whose own deal expires after 2011 — has never lobbied for an extension to his own contracts. So at the very least, he's consistent.